AC Blinds & Awnings have been providing a high-quality blind supply and installation service to a range of commercial customers for over 30 years. We have completed projects for large clients including hospitals and universities and have become renowned for the quality of our work and our keen attention to detail. Whatever your industry, we have the appropriate blind solution for you. Our blinds are manufactured to the highest standard. All blinds supplied to customers in the health sector are HSE approved, flame-retardant and bio-safe. 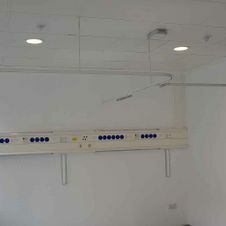 We manufacture, supply and install all types of hospital blinds, having previously completed projects for the HSE, St. Vincent’s Hospital and more. All blinds are HSE approved and manufactured to the highest standard. AC Blinds & Awnings offers flame-retardant blinds for use in all types of commercial applications. These blinds can be woven in a range of styles and colours to suit the business décor. Blinds can feature dual flame-retardant and Biosafe functions. Biosafe refers to an internationally accredited, anti-microbial formula used with blinds to maintain a sterile environment. Biosafe blinds can also feature a flame-retardant function. We have a range of insect screens available which are especially useful during the summer months. These are popular with our commercial customers but also available to domestic customers. Manufactured to the highest-standard, insect screens can also have a flame-retardant function. For those looking to eliminate sunlight from a room completely, our blackout blinds are available in a range of colours and fabrics, so you are sure to find something to suit your tastes. Each Blind can be operated separately or all together. These motors are perfect for retro fits as there is no wiring involved. Motors will run for approximately 6 to 8 months om a single charge. 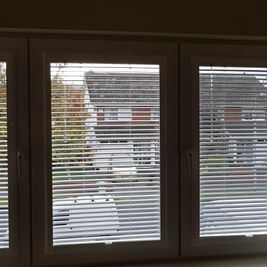 These blinds where fit in Baltinglass Court House. AC Blinds & Awnings supply a range of security grills, popular with our customers in the retail and hospitality sectors. Our security grills are sturdily built and provide maximum protection for your business. AC Blinds & Awnings can provide newly-fitted motorised blinds or update your existing blinds. This is available to both domestic and commercial customers and can be applied to most types of blinds.